Do you love grapes? I do. I remember as a child as soon as the sun started to come up over the field and glistened through the tree line I would take off outside. We had an apple tree, rhubarb, and carrots. My favorite, when in season, was our grapevine. Many meals could be skipped when we hung out by these grapes. As a kid, this earthly vine satisfied my earthly hunger. Still my heart and soul hungered for our True Vine. John 15:1 says, “I am the true vine, and my Father is the gardener”. Jesus, fulfills all needs. 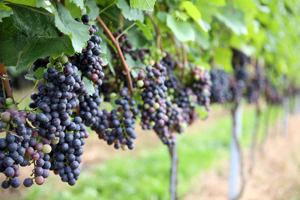 Our True Vine, Jesus, provides nourishment to create any and all fruit in our lives. Independent of this vine, our branches can’t produce fruit. Independent of Jesus, our lives are fruitless. He is the source of nourishment we need. Are you receiving nourishment? The book of John has a series of “I am” statements for us to remember. He says, “I am the Bread of Life. I am the Light of the World. I am the Door, I am the Good Shepherd. I am the Resurrection and the Life. I am the Way, the Truth, and the Life.” He says in John 8:58 I am Eternally Existing, and in John 15, I am the True Vine. Our God is the great I am, and in in John 8:24 it says that we need to believe this. Since we know that Jesus is the true vine, he says His Father is the gardener. The gardener who planted the vine, and cares for it. There are then branches that bear fruit meaning true disciples; or there are branches that produce no fruit, that are cut off. What is my branch looking like? The key to knowing what my branch looks like is in the word abide. Do we abide in Him? This word is repeated eight times in five verses. Starting in verse 4 where abide is used three times. 4 Abide in Me, and I in you. As the branch cannot bear fruit of itself, unless it abides in the vine, neither can you, unless you abide in Me. We need to do all we can to faithfully keep his commandments. To keep his commandments means to love God with all our heart, soul, and mind. We love our neighbor as ourselves (Matthew 22:37–39). Our love for God is in our trust, prayer, and devotion to Him. We abide in relationships, prayers, and in love. When our lives are intertwined with His, true joy fills our days. Even in the face of adversity our consistent relationship keeps us able find joy in all circumstances. So today and everyday, abide. Stay connected to the True Vine that is connected to Jesus.